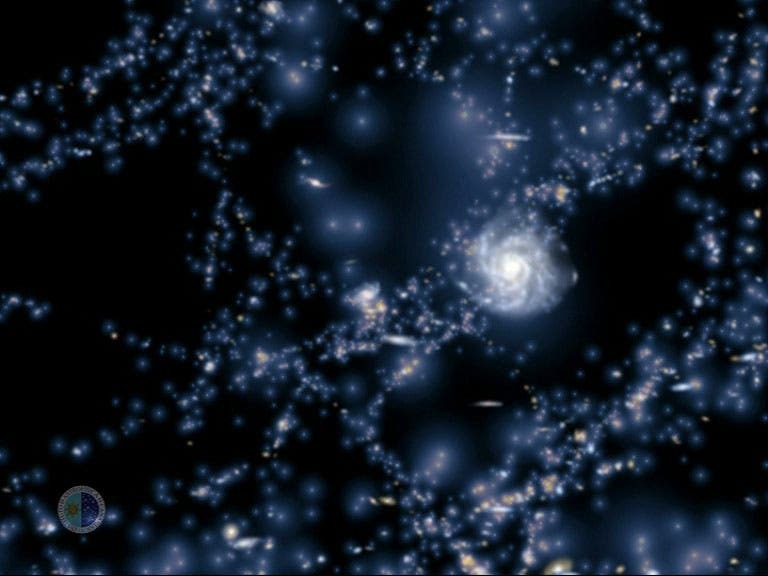 Astronomers at The Australian National University have discovered proof of a vast filament of material that connects our Milky Way galaxy to nearby clusters of galaxies, which are similarly interconnected to the rest of the Universe. “By examining the positions of ancient groupings of stars, called globular clusters, we found that the clusters form a narrow plane around the Milky Way rather than being scattered across the sky,” said Dr. Stephan Keller of the Research School of Astronomy and Astrophysics at ANU. “Furthermore, the Milky Way’s entourage of small satellites are seen to inhabit the same plane. What we have discovered is evidence for the cosmic thread that connects us to the vast expanse of the Universe. The filament of star clusters and small galaxies around the Milky Way is like the umbilical cord that fed our Galaxy during its youth,” Keller observed. There are two types of matter that made up the Universe – the dominant, enigmatic dark matter and ordinary matter in the form of galaxies, stars and planets. “A consequence of the Big Bang and the dominance of dark matter is that ordinary matter is driven, like foam on the crest of a wave, into vast interconnected sheets and filaments stretched over enormous cosmic voids – much like the structure of a kitchen sponge." “Unlike a sponge, however," Keller added, "gravity draws the material over these interconnecting filaments towards the largest lumps of matter, and our findings show that the globular clusters and satellite galaxies of the Milky Way trace this cosmic filament. Globular clusters are systems of hundreds of thousands of ancient stars tightly packed in a ball. In our picture, most of these star clusters are the central cores of small galaxies that have been drawn along the filament by gravity. “Once these small galaxies got too close the Milky Way the majority of stars were stripped away and added to our galaxy, leaving only their cores. “It is thought that the Milky Way has grown to its current size by the consumption of hundreds of such smaller galaxies over cosmic time,” he concluded.